Anna moffo turned down Hollywood to attend Curtis Institute of Music in Philadelphia. She got a Fulbright to finish her studies in Rome, where she starred in televised Opera. Arias. A1 has bad scratches. Everything else is pretty great. she hits the high notes. Found in the Classical library.”Very little musical talk,” reads the librarian’s ballpoint on the reverse. Seymour DeKoven’s home station was WFUV Fordham University. Some listeners found his quirky mannerisms annoying: he played exclusively music from the baroque and rococo eras, omitting the slow movements, characterizing it OTW, Out of This World, or OTG, for Galaxy or OTU for Universe. He called his style Barococo. Play this if you hate the listeners. I know some of you hate The Listener because I’ve heard your shows. Piano and orchestra. 3 movements, 50 minutes. Took Brahms 5 years to write this, completed in 1859. Vigorous, learned, and uncompromising. 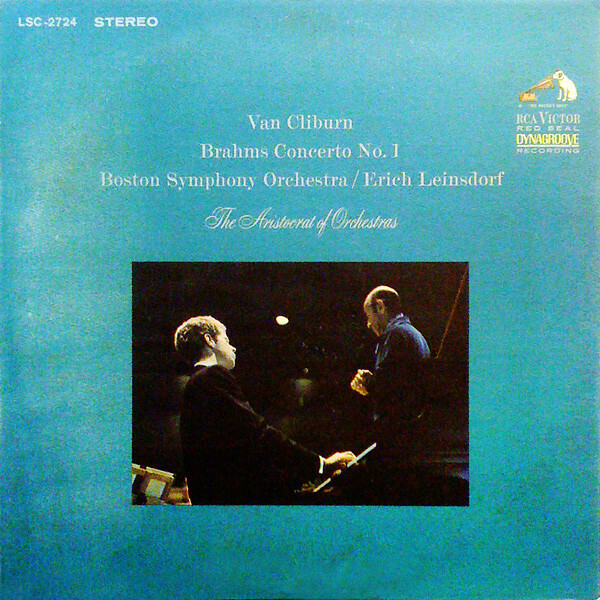 “The Texan Who Conquered Russia” — Van Cliburn on the ivories. Give it a spin! In 1912 Rudolf Firkusny was born in Moravian Napajedla, in what is now Czechoslovakia period he studied with Janacek, touring Europe in the 1920s and premiering in London in 1933 and New York in 1938. He fled the Nazis in 1939, escaping to Paris and settling in New York. William Primrose was a Scottish violist, teacher, and author. 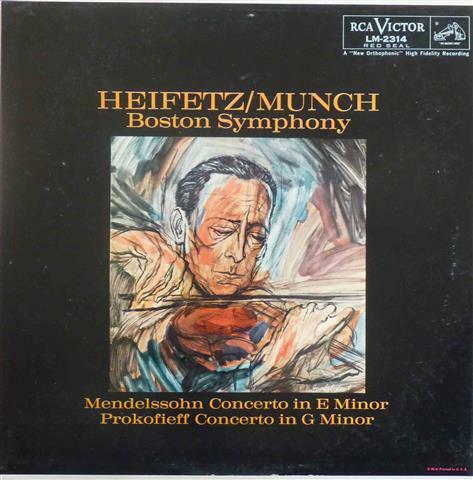 He was part of the NBC Symphony Orchestra with Jascha Heifetz and others. He began in 1924 as a professional violinist and switched to the viola in 1930. Late in life he developed hearing difficulties that prevented him from hearing certain pitches. He died in Utah. Brahms’ Op. 120 are his final chamber works. Published in 1895. Brahms loved the clarinet and wrote These originally for clarinet and piano although he also wrote a version for viola. Side A begins with a 4 bar piano theme in octaves that has been shown in recent analysis to be generative of every musical idea that follows. Side B is not too shabby either. Brahms couldn’t seal the deal and abated his frustration through musical composition. Almost twenty years later Brahms is in love with Mrs. Elisabeth von Herzogenberg and he finds enough of himself to finish. The Violin Concerto in D major, Op. 77, was composed by Johannes Brahms in 1878 and dedicated to his friend, the violinist Joseph Joachim. 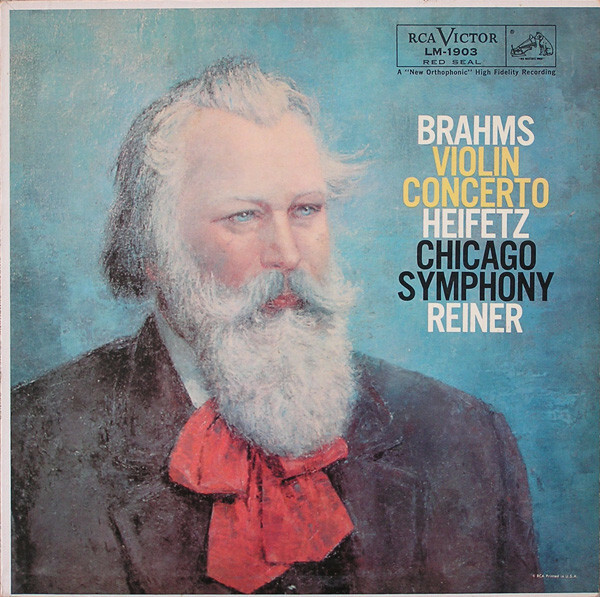 It is Brahms’s only violin concerto, and, according to Joachim, one of the four great German violin concerti. 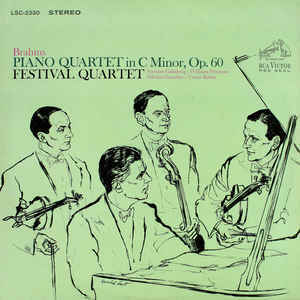 The Piano Quartet in A major, Op. 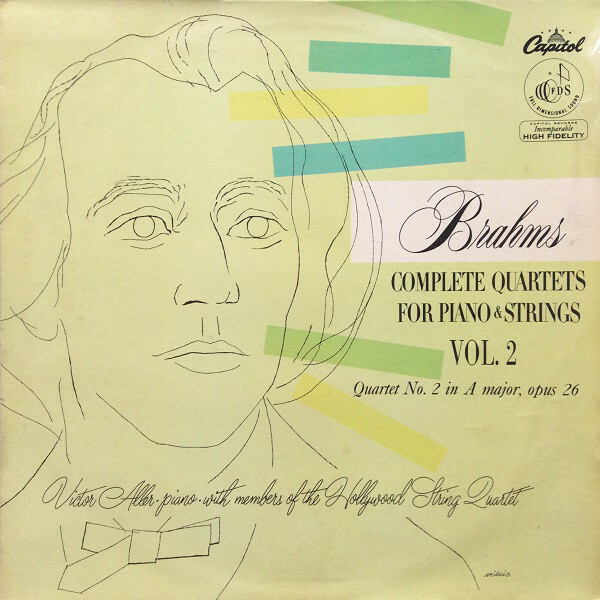 26 by Johannes Brahms, for piano, violin, viola and cello. It was completed in 1861 and received its premiere in November 1863 by the Hellmesberger Quartet with the composer playing the piano part. This quartet is long and shows the influence of Schubert. When performed badly it is quite interminable. None of that here, Victor Allen at the piano with members of the Hollywood String Quartet, Felix Slatkin- violin, Alvin Dinkin- viola, Eleanor Allen- cello. The Kreutzer Sonata is very demanding. It is emotionally varied, technically difficult, and long (performances can last 40 minutes. Composed 1797-8, published in Vienna 1799. At the time of publication, Beethoven thought these were his best works. The musicologist Gerald Abraham has remarked that in terms of their style and aesthetic value the string trios of Op. 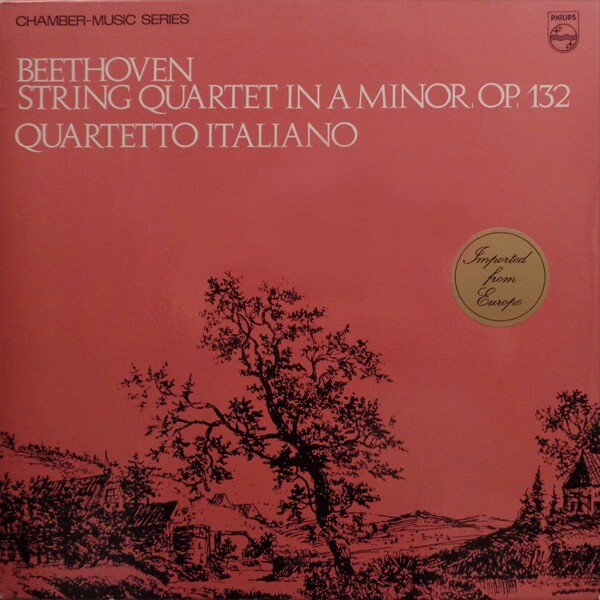 9 rank with Beethoven’s first string quartets which ousted the trios from the concert halls. I find it quite inexhaustible to study. There is a sort of heavenly or at least more than human gaiety about some of his later things which one imagines might come to oneself as the fruit of reconciliation and relief after immense suffering; I should like to get something of that into verse before I die. Every summer, America’s finest classical musicians gather in Marlboro, VT. This dates from 1964. The B side begins with a high-pitched recording defect which resolves just after you begin pulling your hair out. A fine record. Pierre Souvairain was born in Switzerland to French parents, July 30, 1911. In 1953 he joined the faculty at the University of Toronto, and in 1959 he became a Canadian citizen. These pieces are part of a 19th century genre of solo piano music. Beethoven’s Bagatelles, Op. 126 was his final work for piano. He called them “cycle of little pieces,” and they are tracked together on this LP. 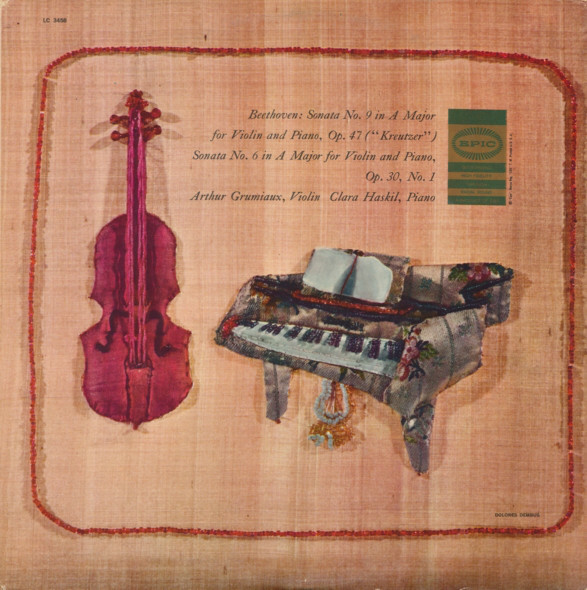 Schumann’s Fantasiestucke, Op. 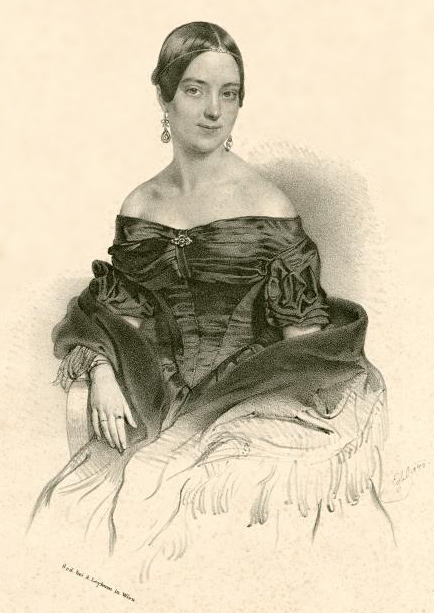 12 was written in 1837, dedicated to Fraulein Anna Robena Laidlaw, an accomplished and attractive 18-year-old Scottish pianist with whom Schumann had become good friends. Dreamy fanciful sketches. 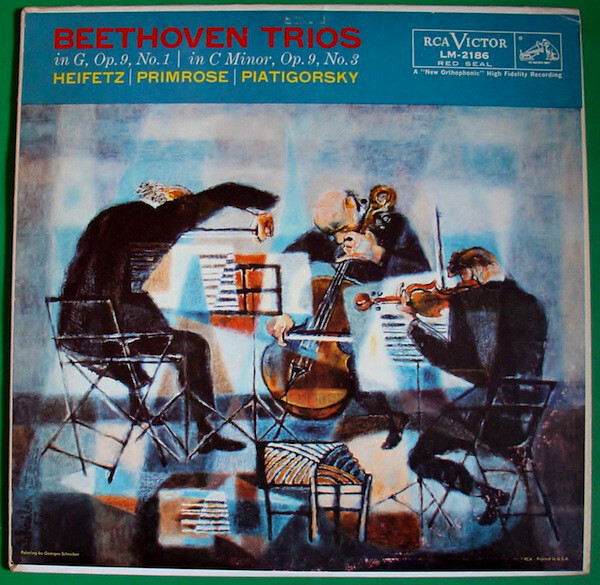 String trio published in 1797 when Beethoven was 27 years old. The first of four, all from his youth. 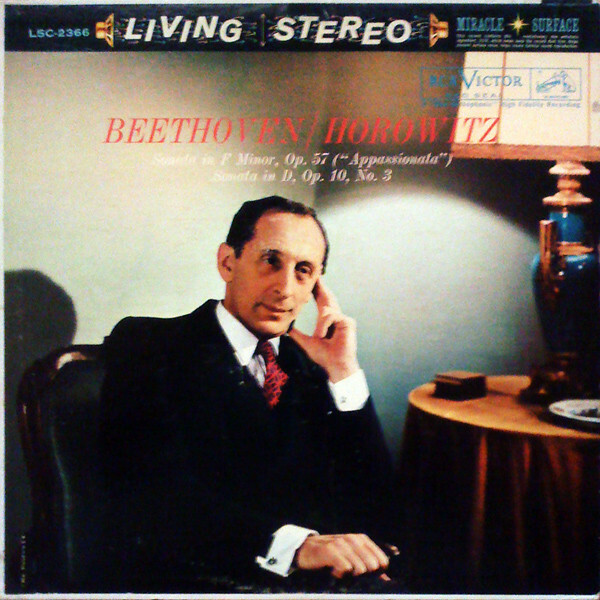 Horowitz married Toscanini’s daughter. 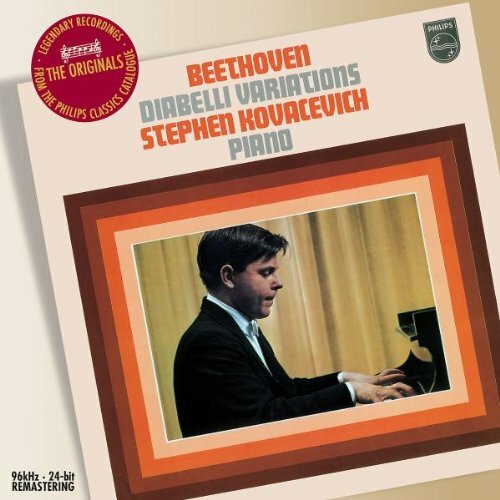 Beethoven piano sonatas. Good for the mood. 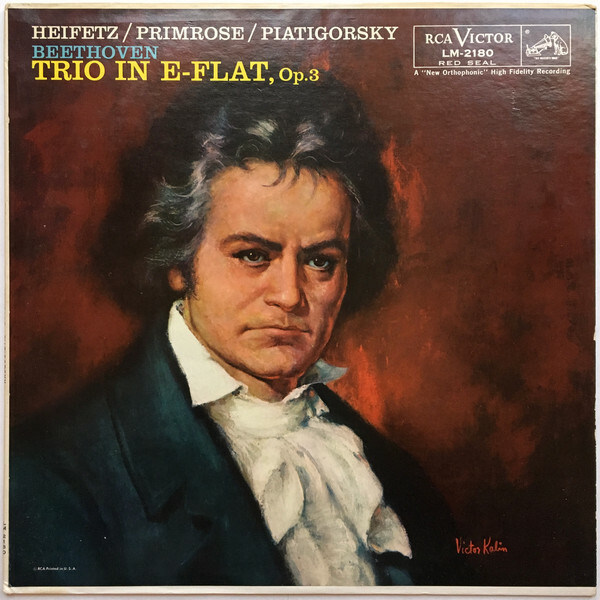 Beethoven took Viennese music publisher Anton Diabelli’s cut-n-paste waltz with one unexpected chord change and freaked it every which way, writing 33 variations. Beethoven pushes the limits of piano composition. Steven Bishop at the piano. Wolfgang Amadeus Mozart born Salzburg, Austria 1756; died Vienna, Austria, 1791. 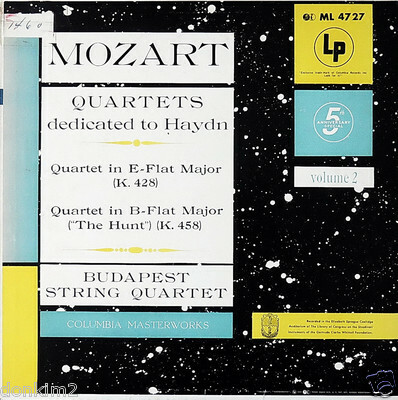 Mozart wrote six string quartets dedicated to Joseph Haydn. Here are two, played by the Budapest String Quartet using the Library of Congress’ Stradivari instruments, given to the nation by Gertrude Clarke Whitall. Great old Mono pressing from 1953. Released February 1951. Heavy vinyl, well-loved condition. In his lifetime, Ravel was dogged by critical and public opinion that regarded him dismissively as a follower of Debussy. 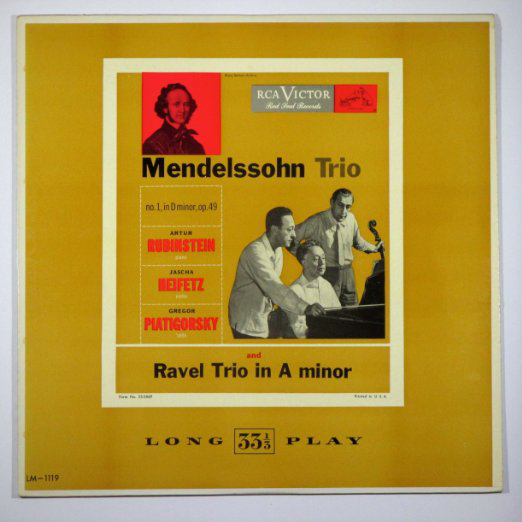 Mendelssohn’s trio is so idiomatic as to be playable by third- and fourth- year students. 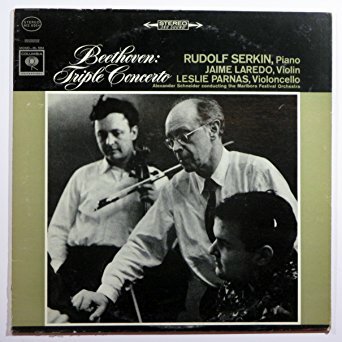 One look into Rudolf Serkin’s steamy bedroom eyes. 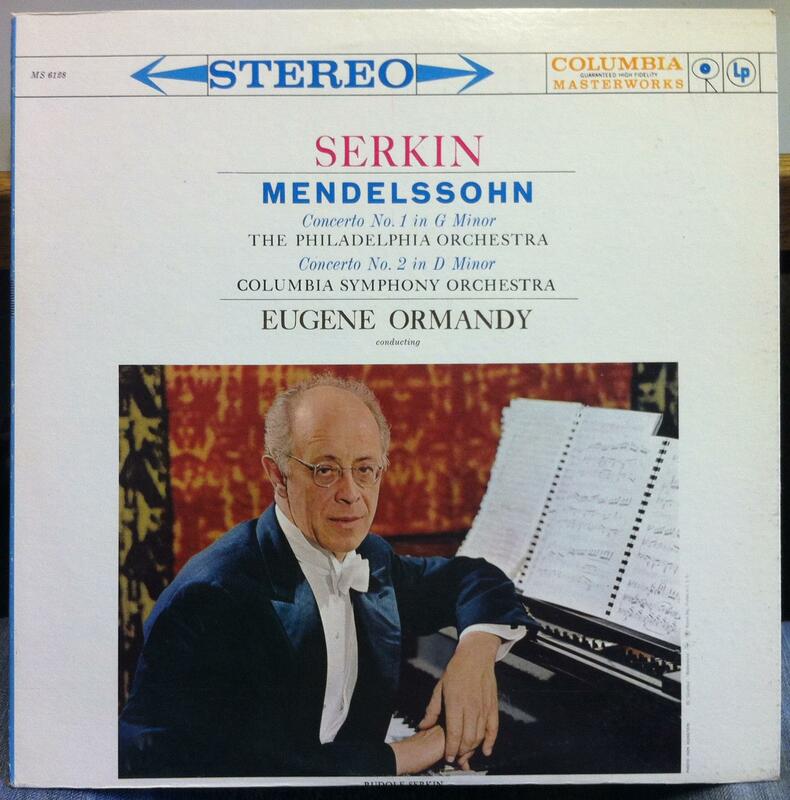 Attention MISPRINT: side a is the Mendelssohn Violin Concerto Number 2 in E Minor Opus 64. IMO it is the better side.